Opposition activists hold a protest against the newly inaugurated Constituent Assembly in Caracas on August 4, 2017. 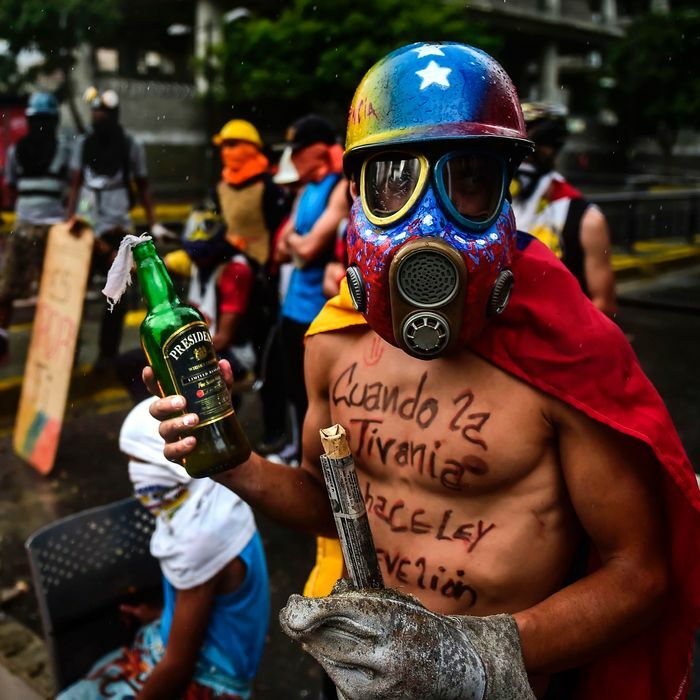 The United States has ratcheted up the pressure on Venezuela. On Wednesday, the U.S. Treasury Department sanctioned eight individuals involved in the creation of the Constituent Assembly, the partisan body elected two weeks ago to rewrite the country’s constitution. The international community has broadly condemned Venezuela’s leftist president Nicolás Maduro for convening the Constituent Assembly, which is seen as an attempt by Maduro to decisively sideline the opposition and consolidate his power, pushing Venezuela toward a one-party dictatorship. Those targeted in the U.S.’s latest round of sanctions are mostly politicians — including the former president Hugo Chavez’s brother — who “participated in actions or policies that undermine democratic processes or institutions,” according to the U.S. Treasury. This latest round of pressure on Venezuela comes after the U.S. slapped sanctions on Maduro himself after the election of the Constituent Assembly — a rare but mostly symbolic move. Thirteen other Maduro associates and high-ranking politicians were hit with sanctions for corruption and undemocratic activities ahead of the vote in July. So far, the United States has avoided more far-reaching sanctions against Venezuela, a move that could backfire, further depleting the struggling, oil-dependent economy and leaving Venezuelans — who are already suffering — to bear the brunt of the fallout. And it could play right into the hands of Maduro, who rarely misses an opportunity to bash America as meddling Yankee imperialists. But it’s doubtful these sanctions will be enough to pressure Maduro and his allies to back off their power grab. This week, the Constituent Assembly confirmed itself as the country’s supreme political body, making clear the judiciary and legislative branches can’t challenge its decisions. The body, whose members were sworn-in this weekend, already ousted the country’s attorney general, a former leftist ally turned Maduro critic. The Constituent Assembly’s next, and perhaps most significant target, will be Venezuela’s legislature, the opposition-controlled National Assembly. Indeed, the Constituent Assembly has already established a “truth commission” to investigate “acts of violence carried out with political motives or out of intolerance” — which many critics see as a way to crack down on all dissent. Maduro has said the truth commission may strip lawmakers of immunity, a not-so-veiled threat of prosecution against his political opponents. Maduro and his allies have consistently blamed the opposition for political violence that has erupted at protests and left more than 120 Venezuelans dead. However, the United Nations said Tuesday that government security forces and pro-government militias are responsible for more than 70 deaths.